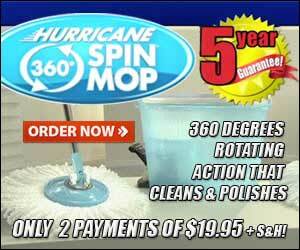 HURRICANE SPIN MOP WASHER & DRYER MOP SYSTEM CUTS CLEANING TIME IN HALF! 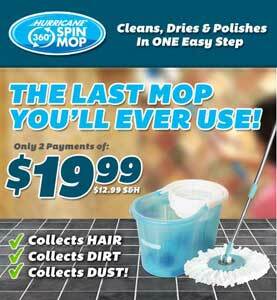 With the Hurricane Spin Mop, you’ll never have to bend your back while mopping the floor! All you have to do is give it a couple of dunks in the bucket, place it in the basket and push down the foot pump. The centrifugal force spins more than ONE THOUSAND RPMs to dry the mop for you! The special head creates a powerful gravity defying suction that literally inhales the mess off the floor and into the mop and it’s machine washable so you can use it over and over again. It’s great for any type of floor! And, with its 360-degree swivel head, you can clean in the corners, clean the sides of the baseboards, go underneath the refrigerator, even clean WITHOUT moving the furniture. The super light alloy mop handle can lie flat so that you can clean underneath your beds and couches comfortably. Today we’ll send you the Hurricane Spin Mop super light alloy mop handle, the super absorbent microfiber mop head and the Hurricane Spin Mop washer/dryer bucket with centrifugal technology for just two easy payments of $19.99 plus $12.99 shipping and handling, conveniently added to your first payment. And, when you order today, you’ll also receive a $15 As Seen on TV card. Use it to shop for some of the hottest "As Seen on TV" products on Telebrands.com or give the card away to friends and family. And, don’t forget, today you’ll have the chance to get free shipping!